PHOTOS: 1 Bryant Park Tower Gets LEED Platinum Certification! 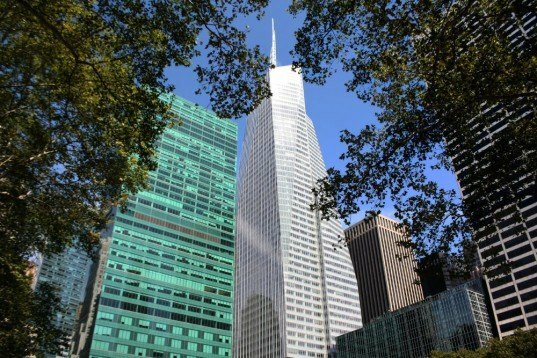 Last year the world's greenest skyscraper, One Bryant Park opened its doors in midtown Manhattan to rave reviews celebrating its innovative design. Today we're thrilled to announce that the green tower has just achieved LEED Platinum certification, making it the world's first office tower to reach the USGBC's highest rating! Designed by Cook+Fox Architects and built by Tishman Construction Corporation, the building has set a historic precedent for sustainable tower design by being the largest of any skyscraper to reach LEED Platinum. As the second tallest building in Manhattan, One Bryant Park is unforgettable and never too distant from any New Yorker’s peripheral view. Now that the skyscraper has been filled with occupants, we couldn’t think of a better time to take some photos of the tower than in the incredible light of the summer sun. Click ahead to see our exclusive photos of this amazing new green construction! Housing the new headquarters of the financial giant Bank of America, the green features implemented in this design quickly allowed it to rack up all the points it needed to garner its LEED Platinum rating. Quite uncommon for a tower of its size, the new building employs a system for rainwater catchement and reuse, greywater recycling, energy efficient building systems, and high performance glass which maximizes day-lighting and minimizes solar heat gain and loss. However, it’s the state-of-the-art, onsite 4.6-megawatt cogeneration plant that really gets the ‘oohs’ and ‘ahhs’ going. The advanced system provides a clean and efficient power source for the building’s energy requirements, significantly reducing its reliance on the NYC grid. The system also perfectly compliments an incredible cooling system that produces and stores ice during off-peak hours, and then uses the ice phase transition to help cool the building during peak load. Another remarkable innovation is the air purification system – not only is the air entering the building purified to a high standard, but the air exhausted is also cleaned, effectively making the tower a giant air filter for Midtown Manhattan. With an area of over 2 million square feet, this level of green technology in one building is nothing short of remarkable. But it’s not all about intrinsic mechanical systems or energy and water conservation, the tower itself was constructed using a concrete manufactured with slag, a byproduct of blast furnaces. The mixture is a concoction of 55% cement and 45% slag, where the use of slag cement minimized any residual damage to the environment by decreasing the amount of cement needed and in turn lowering the amount of carbon dioxide output that would have occurred through traditional cement manufacturing. Moreover, the building was built by and large with recycled and recyclable materials, and all the materials were sourced locally to reduce carbon costs and to support the local economy. I have the stellar photo of 1 Bryant Park, taken on August 27th, 2009. 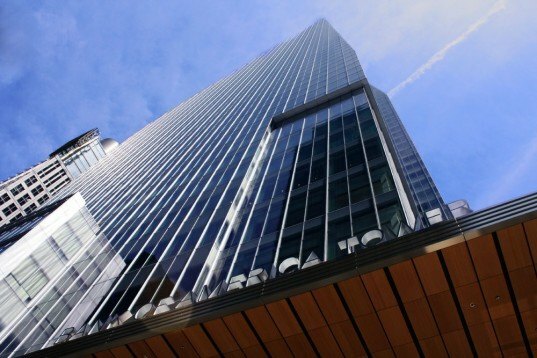 One Bryant Park IS the first skyscraper to win LEED Platinum for new construction. The Joe Serna Jr. Cal/EPA Headqrtrs Bldg. in Sacramento, CA won LEED Platinum for Existing Buildings. Great little article! I was pleased to discover your website which seems quite fascinating. However I was a little put off by what I believe to be an error in the article. I take issue with the factual accuracy of the following statement, "Today we're thrilled to announce that the green tower has just achieved LEED Platinum certification, making it the world's first office tower to reach the USGBC's highest rating!" I'm not sure exactly how you are defining office tower, but the Joe Serna Jr. Cal/EPA Headqrtrs Bldg. in Sacramento, CA achieved a LEED Platinum certification almost 7 years ago. (can be verified at this website: http://www.usgbc.org/LEED/Project/CertifiedProjectList.aspx) Granted it is only a 25 story office tower, but it is an office tower with a Platinum certification. Cheers. Its is all good news, but what is the Bank of America or the owner of the building benefiting from this? What are there reason, why do they want to do this. However i would love for them to try and promote this by having other organization on on board. yes, but who did the Engineering? This really is an interesting building and the photos do an amazing job of capturing it! After looking at these pictures I really want to go see it! Housing the new headquarters of the financial giant Bank of America, the green features implemented in this design quickly allowed it to rack up all the points it needed to garner its LEED Platinum rating. Quite uncommon for a tower of its size, the new building employs a system for rainwater catchement and reuse, greywater recycling, energy efficient building systems, and high performance glass which maximizes day-lighting and minimizes solar heat gain and loss. However, it's the state-of-the-art, onsite 4.6-megawatt cogeneration plant that really gets the renewable energy nerds 'oohing' and 'ahhing' . The advanced system provides a clean and efficient power source for the building's energy requirements, significantly reducing its reliance on the NYC grid. The system also perfectly compliments an incredible cooling system that produces and stores ice during off-peak hours, and then uses the ice phase transition to help cool the building during peak load. Another remarkable innovation is the air purification system - not only is the air entering the building purified to a high standard, but the air exhausted is also cleaned, effectively making the tower a giant air filter for Midtown Manhattan. But it’s not all about intrinsic mechanical systems or energy and water conservation, the tower itself was constructed using a concrete manufactured with slag, a byproduct of blast furnaces. The mixture is a concoction of 55% cement and 45% slag, where the use of slag cement minimized any residual damage to the environment by decreasing the amount of cement needed and in turn lowering the amount of carbon dioxide output that would have occurred through traditional cement manufacturing. Moreover, the building was built by and large with recycled and recyclable materials, and all the materials were sourced locally to reduce carbon costs and to support the local economy. During the construction of One Bryant Park, 91% of all construction and demolition waste was either recycled or diverted from the landfill. 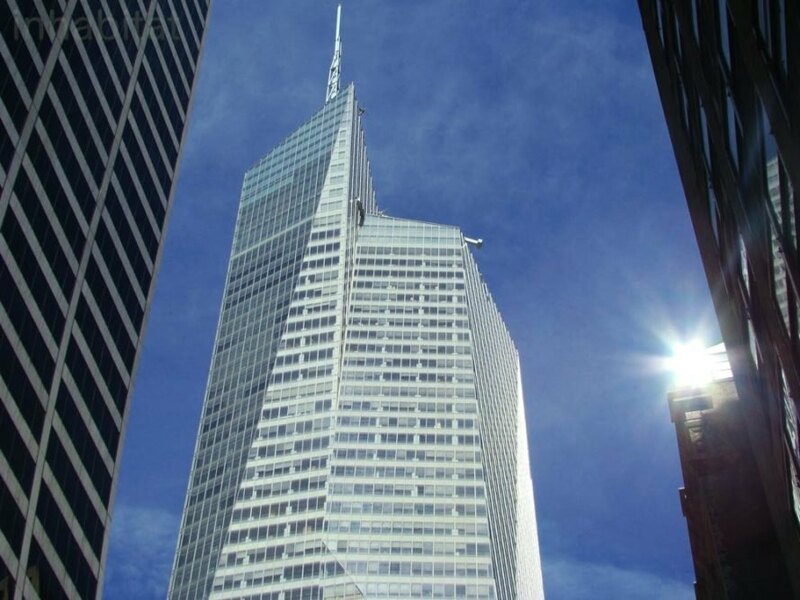 One Bryant Park was completed last year and has just received LEED Platinum certification from the USGBC. One Bryant Park hosts a unique atrium, The Urban Garden Room, which is completely open to the public daily from 8am-8pm. The room is a perfect calm, green escape from the noisy city streets that sit just opposite the glass window. As soon as you step inside One Bryant Park's Urban Garden Room you are surrounded by verdant monoliths that really call attention to the building’s impressive LEED Platinum status. One Bryant Park racks up green points with rainwater cachement and reuse, greywater recycling, recycled and sustainable building materials, energy efficient building systems, and a high performance glass envelope. As the second tallest building in Manhattan, One Bryant Park is far from forgettable and never too distant from any New Yorker’s peripheral view. Stunning, modern and completely sustainable, New York City couldn't have asked for a better addition to its skyline. Neighboring the new Bank of America tower is of course, Bryant Park itself. The greenery perfectly frames any view of the building skyward. One Bryant Park is two-thirds occupied by Bank of America and also hosts the Sondheim Theatre, New York City's first "green theater". If only we could capture a photo that can completely grasp the stellar nature of the incredible One Bryant Park. One Bryant Park is without a doubt an iconic building and an incredible gesture for both modern green design and New York architecture. The tower was originally built to LEED Gold standards, but the tower has far surpassed expectations with its LEED Platinum certification.